G:link is a bold expression of the vision for the Gold Coast. It symbolizes how people in the region connect with each other and their environment. It embodies desire to achieve social cohesion, business success and collaboration. 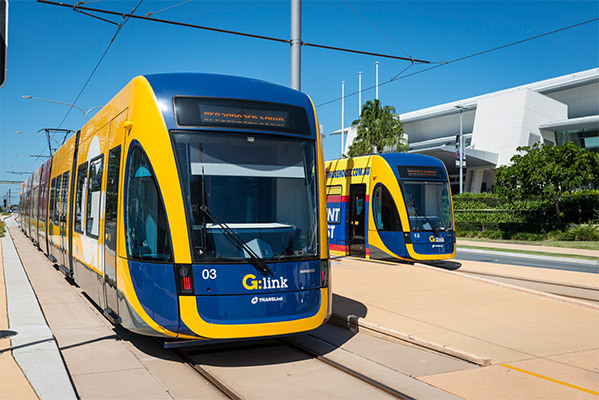 The Gold Coast light rail G:link is the newest light rail in Australia and the first in a greenfield site. It runs the spine of the famous Australian holiday destination coastline. It is also the first piece of public transport infrastructure in Australia with funding contributions from three levels of Government. 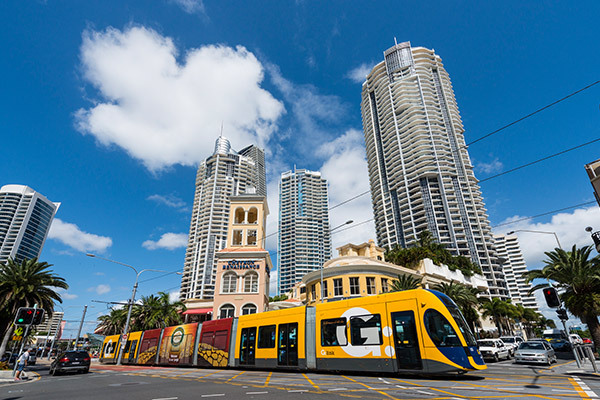 As well as offering a transport solution for the traffic-congested tourist strip, the light rail has laid the foundations for urban growth and renewal on the Gold Coast. Since beginning operations in July 2014, G:link’s original 13km network has performed highly with results of 97% punctuality and 88% customer satisfaction in 2017. 22,000 trips are made on G:link every day which equates to 660,000 passengers every month. 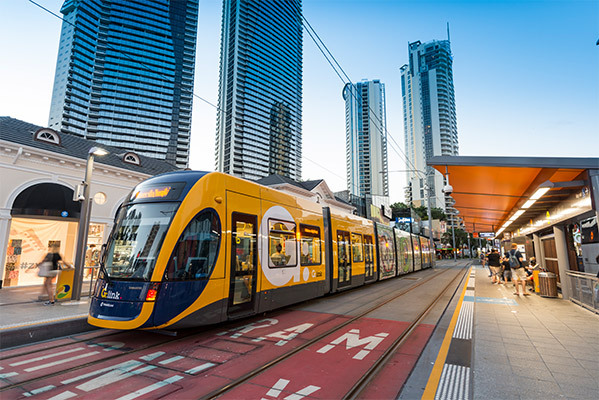 The Gold Coast has seen a 31.8% increase in patronage across bus and tram services, providing a significant boost to the region’s social and economic development. Stage 2 for the G:link encompasses a 7.3km extension north from the Gold Coast University Hospital to Helensvale (to connect with the heavy rail network), and opened on 17 December 2017. The extension increases the network’s total length from 13 km to 20.3 km. A long-term vision is for additional stages to connect more people and places to the Gold Coast, including an extension south to Coolangatta Airport. The light rail has led to urban renewal along the light rail corridor and the wider Gold Coast, with $6 billion worth of development triggered by the line (Gold Coast Bulletin). One of the key beneficiaries of this renewal is the town of Southport, which has been re-energised for local business and shoppers alike. G:link is one of the largest infrastructure projects in south-east Queensland. The GoldLinQ consortium has committed to developing short- and long-term employment opportunities for local contractors and industries. In addition, the consortium has been involved in partnering programs with local TAFEs and universities to develop internships, work experience and other placement strategies for students. To date, the project has spent $550 million at local businesses for labour and materials, with 93% of goods, services and employees procured locally. Local employment commitments have extended into operations, with the majority of G:link’s 150 full-time staff sourced from the region. Recognising the value of the project, the Commonwealth, Queensland and Gold Coast City Council governments have confirmed that Stage 2 of the project will proceed. In April 2016, the GoldLinQ consortium was announced as the preferred contractor to design and construct Stage 2 of the project, with completion before the commencement of the Commonwealth Games in 2018. Customers are certainly happy with their experience of the network, with satisfaction results averaging 88% since it began operating, according to a survey commissioned by TransLink. Positive engagement with passengers is highlighted via Meet the Manager initiatives twice per year, and TransLink has introduced a popular tourist ticket option to encourage visitors to the Gold Coast to use public transport. Introducing a light rail system to a new area requires a major education program. Passengers, pedestrians and motorists must know how to behave safely on and around a network that runs largely in local streets. Keolis Downer ran safety campaigns from pre-launch through to the testing and commissioning phases. The campaign included television, cinema, web, billboard, social media, tram wraps and traditional outlets. The emphasis of the campaigns was on maintaining existing road rules, and liaison with Queensland Police was excellent throughout. The now-famous Rhino safety icon was brought from Yarra Trams in Melbourne to the Gold Coast in August 2015 to remind drivers of the size and weight of a light rail vehicle. A small number of car and tram collisions have been due mainly to illegal U-turns. Safety campaigns to tackle unsafe behaviour are a regular feature in G:link marketing and communications. Sustainability was an important element in the design, construction and operation of the network. G:link is proud to be the first railway to receive an as-built certification from the Infrastructure Sustainability Council of Australia. It received an excellent rating, with almost 200 sustainability initiatives identified. In 2016, G:link will seek to become the first railway project to receive an operator rating. The Gold Coast staff had never seen a light rail service before, so Keolis Downer sent the first group of operational staff to visit Keolis networks in Le Mans and Dijon in France and Nottingham in the UK to learn in a live environment. This group returned to train the other staff on the Gold Coast.